Norman Cramp; Hardback, 2015, Avonmore Books, 154pp, full colour throughout. 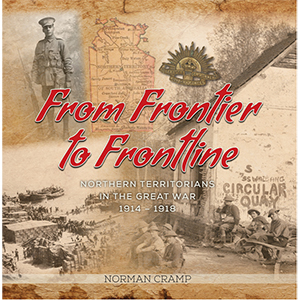 This book is a unique and valuable contribution to Australia’s Great War legacy. It is the result of decades of painstaking research. With no army recruiting centres in the Northern Territory itself, would-be Territorian Anzacs paid their own way to enlist in other Australian states. Indeed, many, such as Albert Borella, VC, undertook their own long and epic journeys. For this reason, until now, there has been no separate list of Territorians who served in World War One. More than 330,000 men, from all walks of life, left Australia to serve in the Great War. But of all the regions who sent men, none can match the colorful assortment of recruits from the Northern Territory. Drawn from numerous nations and many races they shared a highly adventurous spirit. Among their ranks were outback adventurers, bushmen, stockmen, miners, seamen, meat workers, senior public servants; even a pearl diver, a buffalo shooter and a rubber planter. Set against the backdrop of the Great War and its aftermath this groundbreaking work details the lives of the men who served, their fortunes and their fate.